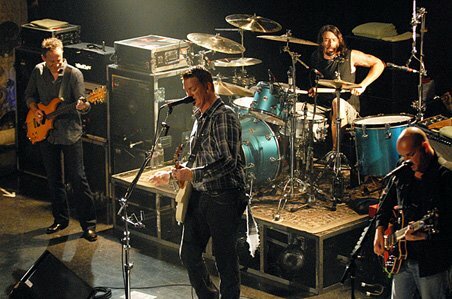 Ok, so I’m fascinated and already a fanboy of the new band Them Crooked Vultures. They’ve begun sending out newsletters to their email contact list now, and what’s official so far is below. Now, on to matters of random speculation. Watch the third promo spot for the band below, somewhere towards the beginning you’ll notice there’s a door, and above that door is the number 15. Could that be September 15th? Maybe a record release date? It is a Tuesday after all. Or, maybe it’s because all their North American tour dates run from October 1st until October 14th – and the tag line at the end of the third promo says “Follow What’s Heard.” Does that mean, the album will drop following the live dates? Hell, I actually just noticed that in total (including the UK dates), there are 15 shows. Maybe that’s all the number represents. Who knows. All I know is, I wish they’d stop selling t-shirts and start selling records. 10-02 Austin, TX – Austin City Limits Festival / Tickets / Visit http://www.aclfestival.com for festival details and ticketing information. 10-09 Toronto, Ontario – The Sound Academy / Tickets / A very limited number of tickets will be sold free of service charges at Rogers Centre Gate 7 on Bremner Blvd. Well, a thirty-three second promo is not much, but I refuse to re-post a poorly recorded, terrible audio version of the (apparently) one song recorded by camera phone from the second of two virtually unannounced live shows by the blossoming heavy metal band Them Crooked Vultures. If you really want to spoil the debut album with this horrible live clip for a song called “Dead End Friends” that’s floating around the ‘net, simply search YouTube. In the meantime, I’ll post the band-sanctioned and awesome sounding snippet in the promo video below. I may be punk rock, but I’m also a purist. And here’s to hoping we get either a release date or some more tour dates very soon! I’m dying in anticipation. I hate the term “supergroup.” It always makes a new band sound like they are the best in their craft or like there is no other combination of artists which could yield such “super” results. And while, yes, every unique combination of musicians in a band creates its own new sound, it does not make it any more super than if another random combination of musicians were to get together and jam. By this account, any side project involving two or more well-established musicians from other notable bands, should qualify as a supergroup. Chicago Sun-Times columnist Jim DeRogatis was there and summed up the 80-minute set like this. After a rather cheap attempt at searching the ‘net, it doesn’t appear there is any video or even music available yet from Them Crooked Vultures except some user video footage on YouTube that is nearly indistinguishable, but there is an official t-shirt! And after bad information in Rolling Stone, it turns out the reported release date is no longer valid either. Though I haven’t heard anything from them yet, I have no doubt it’ll be super when I do. I just promise to refrain from fanboy-ing myself into an album review that calls them a “supergroup.” I have more respect for their music than that.